In our commitment to provide you with the best products that address specific skin concerns, we have gathered 3 different cc creams (and 2 bb creams) up for review. These products were then assessed based on their ability to conceal redness, which one offers the best coverage, and their value for money until we finally picked what we think is the best Korean CC cream for 2017. The Luminous Pure Aura CC Cream by Tony Moly is the first product on this list that adjusts to your skin tone. It is infused with multi-colored capsules to conceal imperfections and redness. Choose the Correct & Care CC Cream by Etude House for a true multi-tasker. It boasts of its 8-in-1 formula that helps deliver healthier skin from the inside out. The Face Shop’s Face It Aura CC Cream is the perfect product for people on the go. It comes in a compact-like packaging with a small button inside which you press to dispense the product. 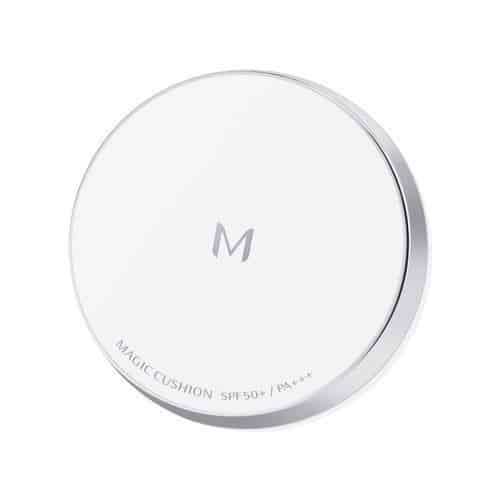 High coverage is what the M Magic Cushion SPF 50+ PA+++ by Missha has to offer. It also comes in a moisturizing and refreshing formula that’s ideal for touch-ups. The Air Cushion Natural Glow SPF 50 by IOPE is for all skin types. It is also an award-winning product, the latest being 2014’s Editors’ Pick as the #1 Cushion Foundation by Allure. Read on as we reveal the best Korean CC creams that are definitely worth the splurge. This is the best cc cream for dark skin because of its color-adjusting formula. It also boasts of its yellow, red, and black color capsules that pop once they reach the skin to conceal any redness. The packaging of this product is very simple. It comes in a white bottle with a black cover—it is a bit large, which means it’s not that travel-friendly and won’t probably fit your vanity kit. However, what’s great is that this cream comes with a pump. This makes the product easier to dispense and of course, more hygienic. Blendable and buildable, this best cc cream for sensitive skin has medium thickness and may take a while to dry. It also has a slight floral smell, but not too much that it’ll make you break out. This product also goes a long way as 2-3 pumps are needed to cover the entire face. The cream itself is white in color, but as mentioned, uses a technology that adjusts to your skin tone. This is best cc cream for redness leaves skin a dewy finish—it’s like a better version of your skin. It doesn’t have a matte or powdery finish, and looks as if you’re not wearing any makeup. What makes this the best cc cream 2017 is that everything you need in a CC cream is here. It is very versatile that though it’s a bit expensive, you still get your money’s worth in every bottle. Its plush and matte finish makes this the best cc cream for oily skin. This product also has 8 benefits in one, so basically all of your skin concerns can be solved by this little tube. This product’s packaging is a simple white tube with a pump at the end. It is quote minimalistic, yes, but it still looks very elegant since the words written on it are in a whitish-gold color. This best cc cream for combination skin comes out white that gradually adjusts to your skin tone once blended out. It is also very lightweight, is not sticky, and has a slightly runny consistency. This product leaves out a sheer and natural finish. This best cheap cc cream might feel too light on the skin, but with its matte finish, is great for those “no makeup makeup” days. This best cc cream for acne not only helps clear up acne but is great with hyperpigmentation, too. It helps lighten dark spots, which in turn results to a more vibrant skin. What makes this best drugstore CC cream great is that it contains Arbutin. This ingredient helps in whitening the skin, and with continued use, you can see a difference in your complexion. We chose this as the best cc cream for mature skin for its anti-wrinkle and a brightening effect on the skin. This “born-color cream” enhances the skin’s luminosity for a healthier appearance. Blendable and buildable, this CC cream uses a darkening-proof formula to ensure makeup stays fresh for up to 12 hours. This feature makes it a great option for those long night-outs. And since it offers long-lasting hydration, it is also our choice as the best cc cream for dry skin. It hydrates the skin for up to 12 hours to make it livelier, clearer, and healthier-looking. This product comes in a pinkish plastic container that’s both handy and sturdy. It also has instructions on how to add the refill, which is one of the reasons we love this product so much. Unlike other CC creams that use skin-adjusting technology, this best cc cream for aging skin is already tinted. It has 2 different shades which could suit those with light to medium skin. This product’s coverage is quite impressive that even those with combination skin will love it. It’s great at controlling oil on your T-zone while being moisturizing on the other areas. If you’re looking for the bb or cc cream with best coverage, then search no more. It has micro-cover pigment that conceals flaws and imperfections for a more flawless look even up close. This product’s packaging comes in a typical white compact case with a tray that flips out that serves as its moisture seal. It also has a built-in mirror and has curved sides for an easier grip. Unfortunately, unlike other BB cushions, this product does not come with a refill. It also has a slight powdery smell to it that gradually dissipates once it is applied on the skin. Great for dry skin, this cushion is infused with bamboo water and baobab tree fruit extracts that moisturizes and hydrates skin. It also contains Witch Hazel extracts to soothe and calm skin. It also contains smooth silica bead powder that helps absorb excess oil and sweat. This product is the best bb or cc cream if you’re aiming for a luminous and natural complexion. It is ideal for all skin types and boasts of its brightening, anti-aging, and sun protection properties. This product is infused with 30% mineral water, peptides, pore elastomers, and antioxidants. These ingredients work hand-in-hand to deliver a healthier-looking complexion with each use. Its 30% mineral water content moisturizes the skin while peptides help boost the firmness of the skin. Pore elastomers help control oil while antioxidants help increase the skin’s radiance. This BB cushion comes in a white, sturdy packaging and has a built-in mirror. It has a small applicator inside which you gently press to get some of the product from the sponge below. It also comes with its own refill which for us is environment-friendly and cost-effective at the same time. Great for sensitive skin, you won’t have any breakouts or negative reactions with this product. So for a lightweight product that won’t do your skin any harm, this cushion is worth the try. BB Cream, CC Cream, or Foundation: What Exactly Should You be Using? It seems like the makeup industry comes up with something new every day. We used to settle with mere foundation as our makeup base, but then BB cream and CC creams were introduced. All these three products basically try to provide you with the best coverage, but they’re not technically the same. So we made some research to hopefully end this dilemma. This product has been used for years in evening out the skin tone. As weird as it may sound, Romans and Greeks would apply chalk or white lead on their skin just to achieve perfection. In terms of consistency, foundation is the thickest of them all. It is also available in different shades depending on your skin tone and is suitable for everyday use. Foundations can offer coverage ranging from sheer to full. They also come in a lot of formulas: moisturizing formulas work best for dry skin, anti-aging formulas work best for mature skin, etc. This product is often applied using a brush (though some prefer using their fingers or sponges.) This will make it more blendable and provide you with a decent level of coverage. This cream is used to reduce blemishes and evens out the complexion. After reaching the US in 2011, tinted moisturizers were phased out since BB creams have so much more to offer. Lighter than foundation yet thicker than tinted moisturizers, some BB creams are formulated with SPF. Their main features however are antioxidants, which help against aging skin. The only downside is compared to foundations, there are limited shade options to choose from. CC creams (complexion corrector or color correcting) have an airy texture and are the lightest of the three. They work well with dark spots or to conceal redness that comes with sensitive skin. Some even contain vitamins like Vitamin C which defends the skin against skin cancer, or Vitamin B which prevents dry skin. They’re basically like skin treatment in a bottle. CC creams work best when worn as a primer under your foundation. This way, you get an evened out skin tone while benefitting from the anti-aging properties it has to offer. Though newbies in the cosmetic world, the amount of followers CC creams have can’t be denied. If you’re looking for makeup that doubles as skin care, you’ve come to the right place. The Luminous Pure Aura CC Cream by Tony Moly is the winner of this round as the best Korean CC cream. It perfectly adjusts to your skin tone which makes it great even for people with dark skin. This product also works great on sensitive skin to conceal any redness. With this in hand, you won’t experience any breakouts or negative reactions—nothing. It comes in a pump bottle which makes application easier and mess free. It is unfortunately nowhere near cheap, but that doesn’t seem to be an issue considering how great this product is.